This morning, the hands of blame are rubbing their way through broadsheets and devices alike. 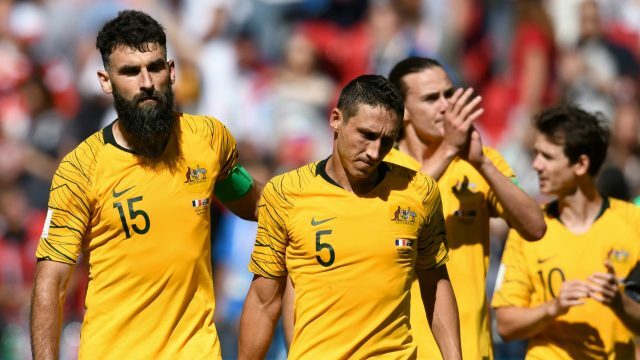 The Socceroos failed at the World Cup, and someone must be held responsible. Bert van Marwijk put Timmy Cahill on too late. The goal was offside. Paolo Guerrero’s ban should have been upheld. Whoever you want to blame, you’re wrong. The Everestian climb to this disappointing point has been one beset with negativity. We bullied Ange Postecoglou out of the position, we castigated the players for forcing us to endure two horrifically jangled playoffs against Honduras and Syria. We even threatened the family of poor Robbie Kruse. We didn’t make it out of the group stage, we weren’t good enough. And that’s not good enough for a nation that assumes the greatest sporting achievements as a bare minimum. Mind you, when they’re good, we’re good. Lifting the Asian Cup was a grand moment, and the spinning electric faces I saw represented what it should be, vibrant pride, not dour expectation. But we only sing when we’re winning. Which is very much the problem. Our sporting entitlement. I was privy to this thinking when we overcame Honduras to qualify on a school night in Sydney. We were going to win, of course. We did, but the final whistle was not met with we’ve made it euphoria, it was muted by grumblings of we should have made it earlier. As the speakers blared an 80s nationalistic banger to prod us into feeling something, instead we quietly filed out and our attention turned to remembering where we parked. I was in bed by 9:30. Days came and went, we got Bert van Marwijk, and we got a favourable group. Expectations sprung eternal. Which is the problem, we focus on the lofty goal, not the moment. We feel like we’re owed something, and we feel that we owe the Socceroos our respect only after they’ve earned ours. Last night, I was fortunate enough to watch the World Cup in the company of a Peruvian. She was living what we did in 2006. Her country had not been to the World Cup in three decades. However, the difference in viewing the same event was obvious. It was kept in the furious mangled Spanglish that poured from her phone, as she struggled to translate her aunt’s vibrant passioned ramblings about humble Andean roots versus the mechanised organs of the European training system. They lost to Denmark the evening before. Now, you could easily pass this off as the cathartic release of a football-mad country enabled, but if we wind our minds back to 2006, save for the win against Japan, our time was mostly focused on scapegoating Zeljko Kalac or heaping abuse at Fabio Grosso. We weren’t proud that we almost beat Italy, we were agitated at being cheated. Shift the calendar forward to 2010, and it was Wilkshire’s miss against Ghana. 2014, and we were saddled with an awful group, we clutched to Cahill’s volley and went home without a point. What we have is a history of recalled disappointment. Not in pride, but expectation. Which is the formative point. Expectation does not birth pride, it cripples it. Look at England. They lifted the cup in 1966 and their expected (and continually dashed) glory has turned them into a formless mass of furious, beer/punch throwing cynics. The World Cup to them is pain, not pride. Anyone who noticed the two fan bases last night could see it. The result had nothing to do with it. The Peruvians were proud prior to kick off, while we were doing sums in our head. Last night’s win was the cherry on an already meaningful cake. To her, it was a bonus, it didn’t define her World Cup. Screaming the national anthem in her apartment did. There were no antagonists, no villains that wore her national colours, just pride. I soundlessly mouthed the lyrics to Advance Australia Fair whilst simultaneously rolling my eyes at the line-up and Googling what channel the France vs Denmark clash was on. Our fan base will never be Peru’s, as I believe we’re too complex to just let go. Ironically, what would birth that outpouring of emotion would be success, but you could argue that they require that support to garner that success. One of the central problems, I believe, is the expanse of our devotion. They live their football, we don’t. Many of us only really care every four years. Improvement starts at home. The defence-first 2004 Grecian vintage should be our example to follow. They toppled the best of Europe with no power up front, counter-attacking football and raucous furious support. They even bested the preening bronze pomp of Ronaldo. They might have had austerity, but they have pride. This morning I suggest it’s best we check where we’ve come from. To check our progress, as well as our privilege. Not too long ago, we were the fodder. The Punchline. We were flogged by Uruguay, we were shamed by Iran, we were bested by a coke-blown Maradona. Our World Cups were defined by where our grandparents were born. Suddenly, the cup is ours, but we’re quick to forget, because we expect. As the World Cup is expanding the number of teams next time around, our qualification is ever more assured, which enables further waves of expectation. I say, no. If we want different, I saw we focus on what we have, be proud, and build from there.